Solar energy has enormous potential, as illustrated by the year-in-review report released by the Solar Energy Industries Association and GTM Research this past Wednesday. The report found that solar panels with the capacity of 1,855 megawatts were installed nationwide in 2011, up from 887 megawatts in 2010, which is a 109 percent jump. Solar is a clean, renewable energy source that can be generated domestically in the United States. This kind of energy production is of growing public concern due to high fuel prices, national security issues arising from foreign oil dependence, and declining health of the environment. But like any energy producing operation, transformers, generators, and inverters are part of the equation when making the product usable by the general public. These pieces of machinery are notoriously noisy and keeping them at tolerable, or even legal levels, can be a huge project. A well-established solar power company set up a new location in a business park and needed to lessen the noise from a solar inverter located in the front of their building. The decibel (dB) level had to meet legal sound ordinances at the property line, and also be at a comfortable level for employees working closer to the equipment. Company officials got in touch with Jack Kay, the environmental sales engineer and head of the Environmental Division at Acoustical Solutions. Kay observed the site and made the following observations: The inverter is about 7.5 feet tall and the source, or person affected by noise, is estimated at an average of 5.5 feet tall. With nothing blocking the noise, a person would hear 67 dB at 9 feet from the inverter, and 38 dB at 238 feet away at the property line. Kay took these numbers and calculated what type of barrier, built to what height, would best bring down noise levels. 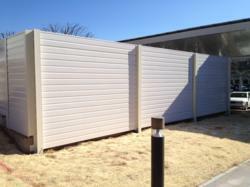 Kay recommended the AcoustiFiber™ Wall System, a fiberglass reinforced plastic barrier manufactured through a high-quality pultrusion process, to be built on all sides of the solar inverter. AcoustiFiber™ is a superior visual and noise barrier wall that meets all AASHTO (American Association of State Highway and Transportation Officials) and DOT guidelines. With an STC (Sound Transmission Class) of 30, the AcoustiFiber™ wall provides the needed sound reduction for congested traffic areas, retail parks and industrial applications. “When I listened to our client describe his noise issue, I knew right away that this would be an AcoustiFiber job,” said Kay, “we are often required to reduce sound from industrial machinery, namely generators and compressors used in energy production, and this wall system checks all the boxes. It is lightweight, easy to install, affordable, and provides ample noise reduction”. The Class 1 fire retardant fiber-reinforced plastic (FRP) material is lightweight allowing for fast modular installation and the ability to install even on challenging terrain. The AcoustiFiber™ wall spans up to 24 feet and requires no heavy equipment for installation or repairs, which will minimize disruption to traffic and damage to surrounding vegetation. The FRP material will not corrode, rust or rot, and it is graffiti, moisture and freeze-thaw resistant meaning that once it is installed, the AcoustiFiber™ Wall maintains visual and structural integrity for 50 plus years of service life. After the AcoustiFiber™ enclosure was installed, the dB level, 9 feet away from the inverter, dropped from 67 to 51. At the property line, 238 feet from the inverter, noise levels dropped from 38 to 32. The decibel reduction for those close to the inverter was 16, an audible noise decrease of between 50 and 75%. For those at the property line, the dB drop was 6, which is an audible change with an acoustic energy loss of 75%.